Dave Cullen is editor of the the immensely useful and detailed Appalachian Trail Parking, Access, Maps and Pictures web site and a veritable cornucopia of personal knowledge about the trail. 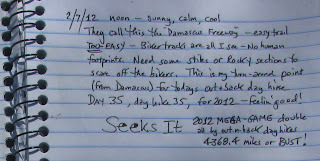 His word on the section of trail I hiked today (February 7), from Damascus south, is that thru-hikers call it the 'Damascus Freeway' because the pathway is so smooth and easy to travel. I've learned to trust what Dave tells me, and so I planned a long hike today - 21 miles, all the way from Damascus Town Hall to Abingdon Gap Shelter and back. And Dave didn't let me down. Here, for a change of pace, I'll let my shelter log book entry at Abingdon Gap speak for itself. 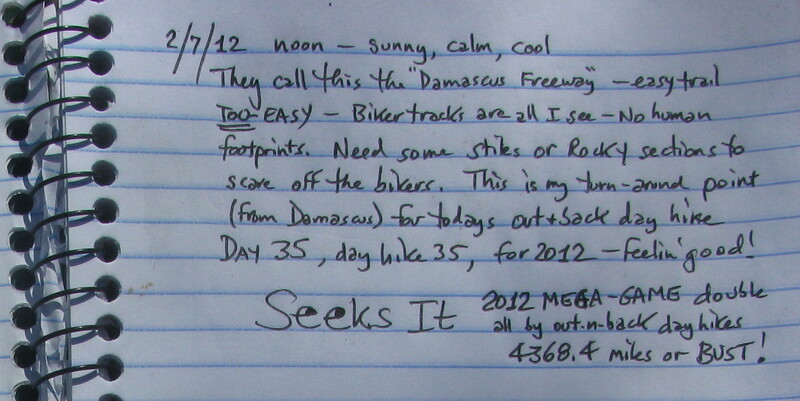 Yes, all I saw were bike tracks and skid marks – no bona fide hiker footprints. That means the trail is *too* easy. Unfortunately it was also rather bland. I was hard pressed to find photo opportunities. Coming south out of Damascus the trail ascends 600 feet in the first mile, and there are some switchbacks at first, but then it comes onto an old woods road. And the ‘freeway’ begins (see the opening picture). In the next two miles, it ascends just another 500 feet, and soon after that you have arrived in Tennessee (yay!) But a picture of a trail sign isn’t exactly Pulitzer Prize material. On I trekked. With a few ups and downs the trail ascends another 700 feet over three more miles before leveling off. It then gradually dips 300 feet and more quickly regains that elevation, whereupon it passes Abingdon Gap Shelter. (Are you yawning yet?) Repeat this elevation profile in reverse order and look for an excuse to photograph something. Although the trail is almost always on the ridge line of Holston Mountain, potentially in view of the Great Valley in the Abingdon area for many miles, there is never more than a teasing winter glimpse of that grand landscape through the tangle of twigs and limbs. Fortunately, with the fine footing, I was back in Damascus early enough to take a little walking tour. Finally something to photograph! I walked a bit of the Virginia Creeper Trail and then went over to the old Damascus Mill, now a restaurant and convention center (closed for the winter). It has a pretty waterfront that in no way resembles a freeway. In fact it’s next to a town parking lot – another place where hikers are welcome to keep their vehicles overnight. Yes, the trail leading to Damascus from the south is like a Freeway - long, flat, smooth, fast ... and not designed for sight-seeing. Well, at least there's something worthwhile at the last exit.